La Casa de Maruja is a great hostel. 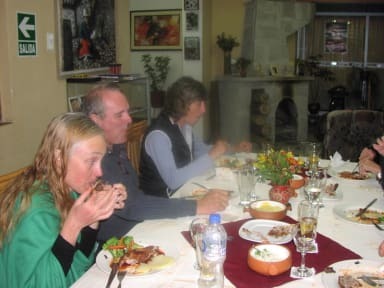 Located a few minutes outside of Huaraz, it is in a safe and quiet neighbourhood. But not to worry, getting downtown is fast, easy and cheap. For only 1 sole per person, you can catch a "collectivo" taxi to the main square in under ten minutes. The family running the hostel is extremely warm and friendly. They treat you like family and are happy to help you plan any day trips or multi day hikes. You can rent any gear you need from them. Highly recommended! My girlfriend and I stayed here for a couple of days during a bit of a jam-packed tour of Peru and we wanted to get out and walking in the Cordilleras as much as we could in two days whilst staying somewhere as a base. The place is super lovely and the staff are all really nice :) the kitchen facilities are really good and the breakfast they provide is great. They also lent us a map for our adventures which helped. The location is slightly out of the centre but this wasn’t really an issue. I absolutely loved staying at La Casa De Maruja. Everyone who works there is lovely, and very friendly and helpful. Despite booking a dorm bed, I was given a private room and was allowed to stay til 9pm the night I checked out. The family even invited me to join them for Christmas celebrations! 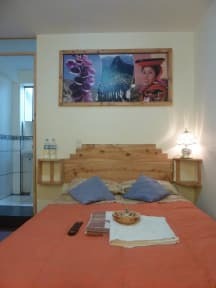 Although it is located out of the main part of Huaraz, I would absolutely recommend staying here - I really felt welcome and cared for. We loved our stay here. Planned for 3 days and stayed 5. Maruja and family make you feel completely at home. Definitely worth the inconvenience of "commuting" in and out of town. Such a great, quiet hostel! We stayed here before and after our four day Santa Cruz trek and they kept our big bags for us. The staff is so helpful and accommodating even with changes in our schedule and our late arrivals. Its a 30 min walk from the city center but we definitely recommend staying here. My friend and I had a lovely stay here. The owners are by far the most loveliest people on this planet. The space is more like a bed and breakfast, it’s very clean and basically all you need to prep yourself/ unwind from the hikes. We had a very early start one morning and were still given breakfast! The food is yum and you can use the kitchen too. Definitely would reccommend. Not in the best location but not much else to do in huaraz so we didn’t mind being a little further away. I was alone in this hostel, but I loved every part of it. Clean good beds and showers, a nice place to relax with a climbing wall and the nicest people I have met so far. This was a great hostel the family who own it are genuinely good people and will do their best for you with organising tours, taxis etc. Downsides was the atomosphere when i was with not ma y people there. Phenomenal staff. They make you feel like you’re at home. They let you cook your own food and also provide a great breakfast. The rooms are spacious and very clean. Gilf, the owner, is a guide who trains other guides and knows everything about the city and wha to do. The hostel is kind of far from the main city. It takes about 40min to walk or a 10min collectivo which is not always easy to find on way back. Its easy to get to town however. Perfect for longer stays or a place to relax. The hosts were so welcoming!! They went out of their way to make sure we had a fantastic stay. Extremely knowledgeable about mountaineering, tours, climbing, and more. Getting to downtown was an easy 10 min taxi ride for 5 sol. Rooftop and bouldering wall added a special flare. We would love to come back and stay again!